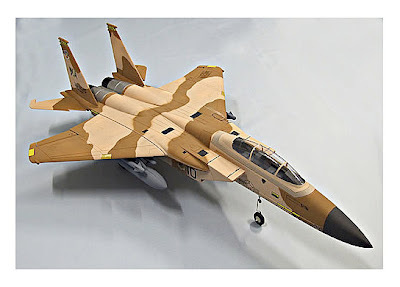 The F-15 Eagle is a mighty popular subject for kit makers, and there's been a huge number of kits in all scales put out since the first flight of the twin-jet interceptor, back on July 27, 1972. SMN could do a thick book on them (and maybe we will) but today, let's just take a snapshot of what's out there. So here is a trio of Eagles, three among many! 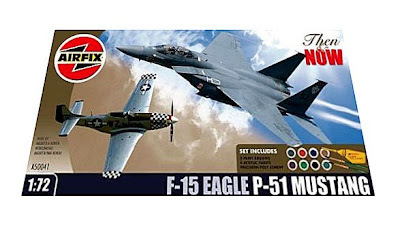 First off (top picture) is a ‘trad’ plastic kit from Airfix in the form of the good value 1:72 scale ‘Then and Now’ twin kit of an F-15E Strike Eagle and P-51D Mustang. Both are acceptable kits, if not leading edge, but at the reasonable £16.99 GBP ($27.88 USD), who’s complaining. They would look impressive together on a diorama scene, perhaps as they might appear on an air show flight line. Guillows (middle picture) presents an unusual take on modelling, with a balsa wood skeleton display model, to 1:40 scale. The choice of material is a contradiction in terms - a wooden Eagle anyone? - but it builds into a impresive display piece, with a big 324 mm (12.75 in) wingspan. Last but not least comes a ducted-fan Eagle (bottom) from Freewing - and wow, what a performer for radio-control fans. As the video shows, this Eagle is controllable even in gusty conditions, and can blast through the skies at 112 km/h (70 mph). The pre-painted kit comes complete with everything you need to fly, except batteries, at £169. Airfix kits are available from Amazon here. Nitrotek markets the Freewing F-15 here.